Memories of pumpkin pie with a zesty finish. Combines Rooibos, Ginger, Apple pieces, and Honeybush. Cup Characteristics: Memories of pumpkin pie with a zesty finish. If an apple a day will keep the Dr. away, what will Apple Ginger Rooibos, with a side dose of Honeybush, do for you? Let’s check it out. Carrying on… another South African favorite, Honeybush adds a honey-like flavor and aroma to the blend – along with a host of additional health benefits. According to natural health practitioners, drinking honeybush can lower blood sugar, calm the nerves, and ease the symptoms of menopause. Finally, we come to ginger, one of nature’s most powerful natural remedies. Known to contain gingerol, a substance with powerful healing qualities, ginger has been used for millenia to treat everything from nausea to morning sickness, muscle pain, osteoarthritis, chronic indigestion, lower cholesterol and more. If Apple Ginger Rooibos is starting to sound like medicine, have no fear – it tastes like Heaven. 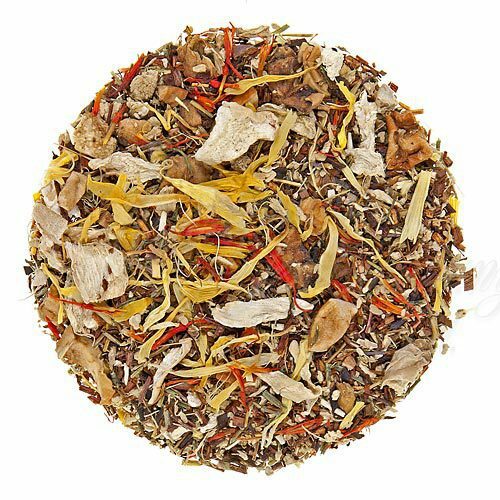 Woven with rich, spicy sweet notes layered over mellow herbaceous tones, apple ginger rooibos is a delicious as it is nourishing. A cup a day’ll do ya. Hot tea brewing method: Bring filtered or freshly drawn cold water to a rolling boil. Place 2 slightly heaping teaspoon of loose tea for each 7-9oz/200-260ml of fluid volume in the teapot. Pour the boiling water into the teapot. Cover and let steep for 5-8 minutes according to taste (the longer the steeping time the stronger the tea). Add milk and sugar to taste.